Shot on video in 1980 -- both for budgetary reasons and to vaguely suggest a self-aware TV soap opera -- the two-part film Personal Problems is unlike most anything you've seen. It doesn't even quite resemble director Bill Gunn's (relatively) best-known work, the moody 1973 horror drama Ganja & Hess. With its loose, improvisatory feel and frequent moments of overlapping dialogue, Personal Problems suggests a marriage between John Cassavetes and Robert Altman, if they were middle-class African-Americans. 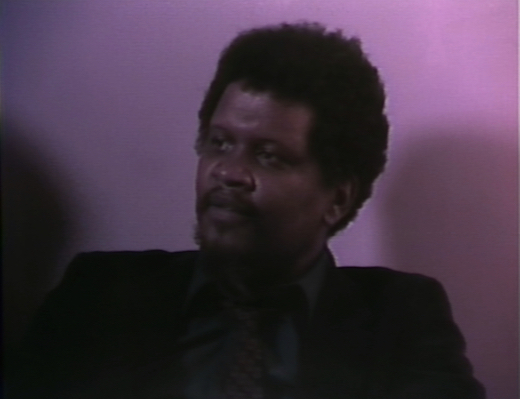 Conceived by poet and Mumbo Jumbo novelist Ishmael Reed, Personal Problems began life as a "meta soap opera" on producer Steve Cannon's New York radio show, before Bill Gunn was recruited to turn the material into a modern answer to the "race films" of the early 20th century. The core cast from the original radio productions -- Vertamae Smart-Grosvenor as night nurse Johnnie Mae Brown, Walter Cotton as her disgruntled husband Charles Brown, and Jim Wright as Charles's loafer of a dad -- returns for the film. The fact that the main actors essentially lived with these characters for a few years before filming adds to the natural feeling of their interactions, even when things get heated and histrionic. Kino's nicely decked-out Blu-ray of Personal Problems includes the original six-episode radio play, as well as a 40-minute first attempt at the film from 1979, which shows the development of the relationships between the actors as they blend into their characters. A particular argument -- in which Charles wakes up grouchy, after staying up waiting all night for Johnnie Mae to come home -- appears in all three versions. In the final version, angry yelling is replaced by quieter, passive-aggressive seething, which is a more interesting (and believable) approach to the scene. If we haven't argued like this -- trying to hold it together while still getting some solid jabs in at our partners -- we've certainly seen folks we know behave this way. It turns out that part of the reason for the acrimony between Johnnie Mae and Charles is that they both have found other people to love. In Johnnie Mae's case, it's Raymon (Sam Waymon), a songwriter and performer in the Gil Scott-Heron mold who appreciates Johnnie Mae's artistic temperament. One of the film's signature scenes depicts Johnnie Mae standing beside Raymon as he plays a heartfelt ballad; she becomes overwhelmed with the emotion of the song as tears roll down her face. By all accounts, the tears were real -- just Smart-Grosvenor's legitimate reaction to hearing Waymon's song -- and cameraman Robert Polidori captures the scene in one, long close-up that travels between the man and woman as they open their hearts to each other. Although Reed and Gunn allow a plot to start to form roughly a third of the way into their 164-minute diptych, they have greater interest in seeing the way these characters live their lives. 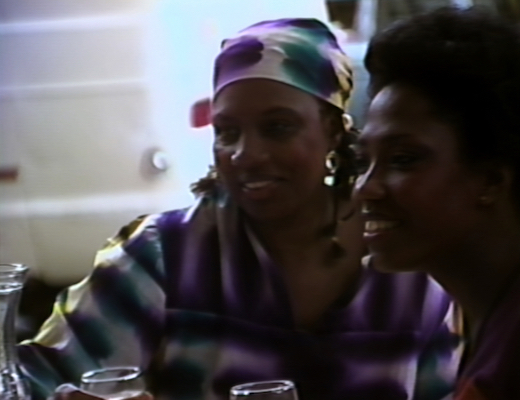 In the first part of the film, there is a long brunch scene between Johnnie Mae and two of her girlfriends, gossiping about their love lives and their plans for the future. Much like the memorably long bar-room sing-along sequence in Cassavetes's Husbands, this brunch doesn't move the story along much. It just lets us see these ladies enjoy each other's company. In the second part, Reed and Gunn offer a rhyming section in which Charles and some male relatives get drunk and blab to each other after a funeral. The attitudes, the language, and ease with which these folks relate to each other are clearly what interest the filmmakers most. After a decade of cartoonish '70s blaxploitation films, Reed and Gunn just want to present onscreen what people look and sound like. Of course, the film doesn't completely escape some broad contrivances. In a storyline that gets abandoned almost as abruptly as it's introduced, Thommie Blackwell and Andrea W. Hunt play some country-bumpkin poor relations of Johnnie Mae, named Bubba and Mary Alice, who move in to the couple's already crowded apartment. Inevitably, they become a nuisance; Reed and Gunn comically elide past Bubba and Mary Alice's first few weeks in the apartment to get straight to the moment where Johnnie Mae has a breakdown over their irritating presence. Their storyline has a few sharp turns and then disappears, as the central couple come back into focus for the finale. Gunn and Reed both appear onscreen in small-ish roles. Reed appears in a party scene as an entrepreneur who proudly voted for Reagan ("I like his movies too! "), while musician Kip Hanrahan, as a trust-fund activist, argues with him for being a sellout. (This would-be-woke white guy skirts using the N-word by telling Reed's character, he's "the black version of the House Jew.") Gunn, meanwhile, is a dapper crime boss who potentially has work for Johnnie Mae's con-man brother. Personal Problems is the kind of film that eludes simple description or synopsis. Looking at my notes, there are at least a half-dozen scenes and small moments that struck me as memorable, but I haven't even managed to mention them here yet. In brief: Anyone seeking impressive production values or tidy storytelling is going to be sorely disappointed. But Personal Problems joins the ranks of those transcendent films that celebrate humanity in all its unruly glory. It ain't unduly pretty, but it is truly special. Personal Problems comes packaged with a booklet, featuring a written introduction by Ishmael Reed and an essay on the making of the film by Nicholas Forster. Shot on 3/4" U-matic tapes, then converted to HD, this AVC-encoded 1080p 1.33:1 transfer is naturally going to be less technically impressive than most Blu-ray presentations. There are flaws inborn to the format, such as a lack of depth and, of course, ghosting, which leaves little trails onscreen whenever the lens passes a light source. Videographer Robert Polidori, who has become a renowned still photographer in the intervening years, has an eye for striking, tight compositions that become almost dreamy with the ghosting effect. I also noticed some banding and posterization in certain low-light shots, presumably due to the encode, that I personally enjoyed and thought added enjoyable texture to the frequently unstable video image. Colors are fairly strong, and this presumably looks a lot cleaner than the muddy dubs that were circulating before Kino went back to the original camera tapes to reassemble the film. The LPCM 2.0 stereo audio has the same kind of low-budget issues that are present in the video. Some sporadic hiss and buzz. Some imperfectly recorded dialogue. Add to this Bill Gunn's penchant for overlapping dialogue in big group scenes, and there are many moments where the words are not entirely intelligible. Sadly, Kino has not provided a subtitle track either (maybe they were afraid to tackle all that overlapping talk -- who knows?). On the other hand, Carman Moore's jazz-tinged musical score sounds great and full-bodied; there's even some channel separation, while the dialogue sticks strictly to middle. I have a set-up where I can listen to films with headphones if I want. With the imperfect sonics of this one, headphones are definitely recommended. Personal Problems: Continuing a Tradition (HD, 25:21) - A new featurette in which writer Ishmael Reed, producer Steve Cannon, and actor Sam Waymon discuss the development of the project from a radio play to the "preliminary" short film to the completed and misunderstood final product. All three gentlemen are charming characters who lay out the process with verve and charm. Preliminary Short Film Version (HD upscale, 38:54) - The first attempt to turn the radio soap opera into a video soap opera. There's some story overlap, but the approach feels a little broader and stagier. Johnnie Mae and Charles's antagonism is more straightforward and less passive-aggressive, which is a little less interesting. Deleted Scenes (HD, 28:21 total) - These scenes were found on the original camera tapes and recently edited in an attempt to approximate what they might have looked like in the film. Some cool character moments, and some inventive story threads, but it seems a lot of this stuff might have gotten nixed for technical reasons. For instance, the overlapping dialogue in one scene becomes cacophonous and unintelligible. Extended Scenes (HD, 8:54 total) - Additional moments from some confrontational scenes later in the story. I won't say much more, to avoid potential spoilers. Six-Part Radio Drama (2:55:53 total) - Ishmael Reed's original "meta soap opera" idea, as originally presented on Steve Cannon's radio show in 1977. It's interesting to hear what story ideas and snippets of dialogue stuck around from these early performances all the way to the final product, as well what different ways that Reed and the actors pushed the premise that is markedly different from what ended up onscreen. Q&A at the Restoration Premiere (HD, 13:32) - Reed, Cannon, and Waymon talk about the film at New York's Metrograph theater. At one point, composer Carman Moore comes up from the audience to share his experiences. A beautiful deluxe presentation of a forgotten and nearly lost treasure of independent African-American cinema. Fans of John Cassavetes and Robert Altman, take notice. Highly Recommended.